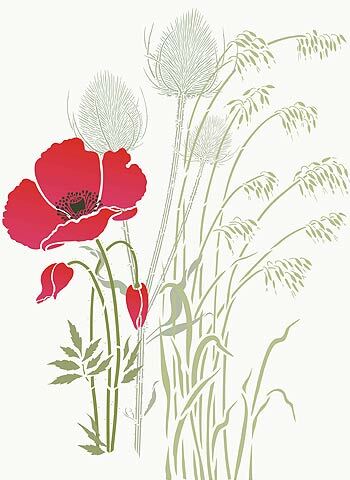 Giant Poppy Flower Stencil 2 is a supersize graceful wild poppy motif, with its soft full blown flower, bud, leaves, seed pods and intricate stamen. 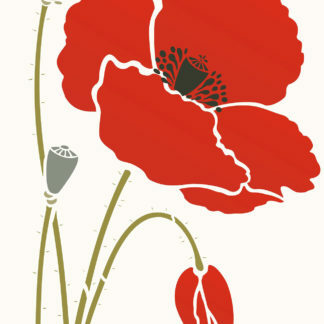 This stencil also has additional stalk and leaf motifs for extending the height of the poppy flower. See size specifications below. 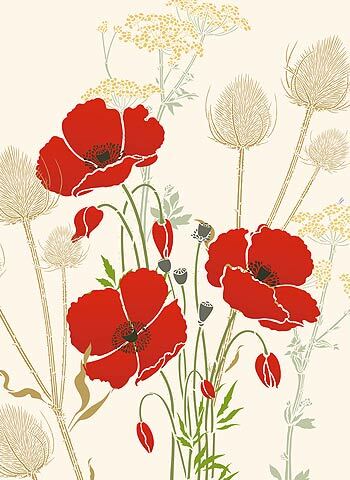 The giant poppy flower motifs are taken from Henny’s carefully observed summer meadow flower drawings, that capture the timeless beauty of these delicate flowers. 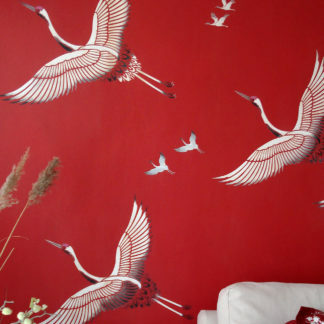 Beautiful stencilled on walls as large mural features or on boards or on fabrics as both a single motif or repeated in rows or columns. 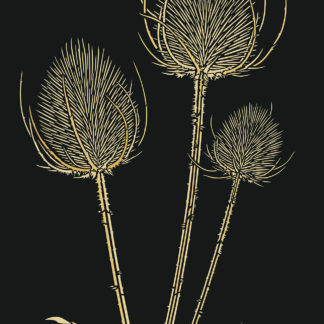 Stencil individually or with Giant Poppy Stencil 1 and Giant Poppy Stencil 3 or with our stunning Large Teasel Stencil, Giant Hogweed Stencil or Oversize Wild Oat Grass Stencil to create wild meadow murals. Different examples are shown on this page. 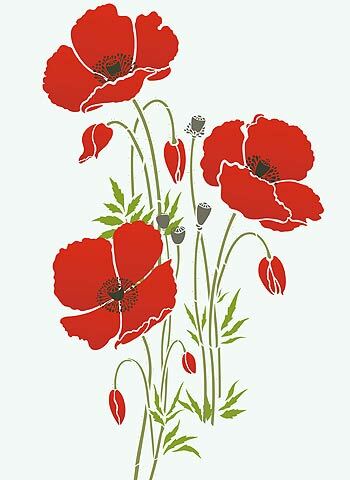 Above top – the main motif of the Giant Poppy Flower Stencil 2 stencilled with added stalk extensions to create a tall single poppy motif – showing how the large poppy can be adjusted to suit different wall heights and fabric lengths. Stencilled with Cerise and Very Berry Stencil Paint (flower and buds) – paint being blended with Stencil Sponges on the stencil to create the graduated effect. Stalks and leaves in Olive Grove and Hedgerow Stencil Paint. 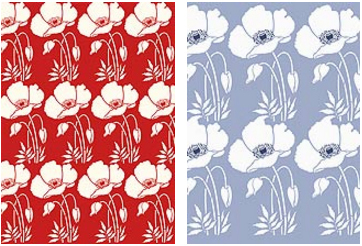 Above – the three Giant Poppy Stencils – Stencil 1 (middle), Stencil 2 (right) and Stencil 3 (left) all with stalk extensions added to increase height – use this layout to make a truly stunning oversize wall feature. Stencilled in Very Berry, Verbena, Umber Charcoal and Jet Black Stencil Paints. Above – Create a beautiful supersize mural with Giant Poppy Flower Stencil 2 stencilled with our delicate Giant Hogweed Stencil and Large Teasel Stencil. Stencilled in Seville Orange and Mandarin (flowers and buds), Hedgerow, Olive Grove Stencil Paint (leaves, stems), Coffee Bean Stencil Paints (stamen) and Grassland and Latte Stencil Paints (hogweed and teasels). Above – Create this delicate meadow feature with the Giant Poppy Flower Stencil 2, with stalk extensions and our Oversize Wild Oat Grass Stencil and wild Large Teasel Stencil. Stencilled here in Cerise and Very Berry Stencil Paint (flower and buds), Hedgerow Stencil Paint (poppy leaves and stems) and Spring Vine Stencil Paint (grasses and teasels). 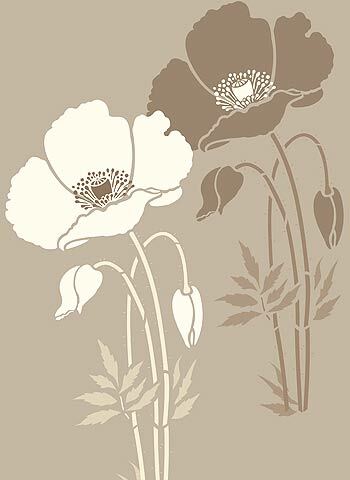 Above – Giant Poppy Flower Stencil 2 with added stalk extensions stencilled in an overlapping arrangement. Stencilled first in Coffee Bean and Chocolat (flower and stalk) and Vanilla (stamen) Stencil Paints and then stencilled in Vanilla and Latte (flower and stalk) and Chocolat (stamen) Stencil Paint. Using a lighter and darker tone than the wall colour is always an effective way to create a tone-on-tone colour palette with the wall behind acting as the third colour – this gives real depth to a theme. Above – Create an impressively large wall feature by stencilling all three Giant Poppy Stencils together – Giant Poppy Stencil 1 (middle right), Giant Poppy Stencil 2 (bottom left) and Giant Poppy Stencil 3 (top left) arranged as a supersize grouping (at least 1.7m/5.5ft high). 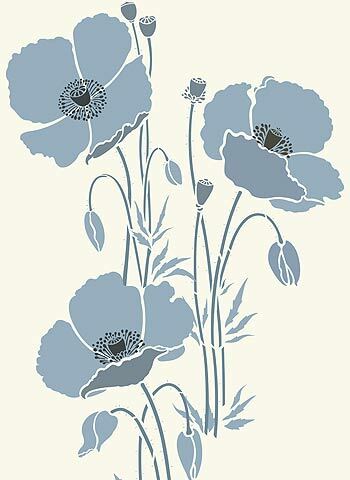 Stencilled in calming greys – Arctic Grey, Storm and Navy Charcoal Stencil Paints. 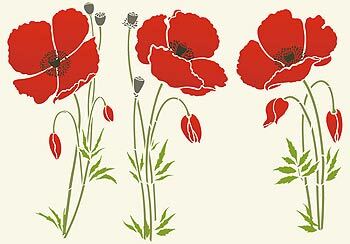 See our Giant Poppy Flowers Stencils 1, 2 & 3 at a reduced combined price. 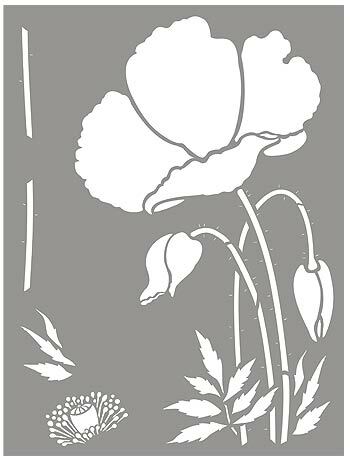 Giant Wild Poppy Stencil 2 – this page. Above – the bold and beautiful supersize main motif of the Giant Poppy Flower Stencil 2 (without stalk extensions added). Stencilled here in Harvest Gold and Seville Orange Stencil Paint (flower and buds), Verbena and Olive Grove Stencil Paint (leaves and stems), and Coffee Bean Stencil Paints (stamens). 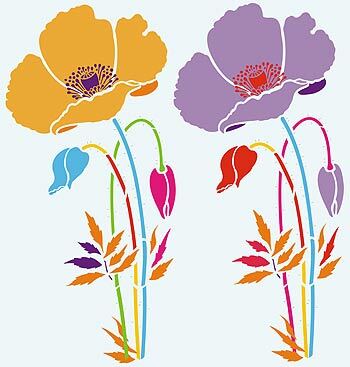 Above – Giant Poppy Flower Stencil 2 with added stalk extension to create a tall motif, repeated twice in a vibrant mix of multi tones. 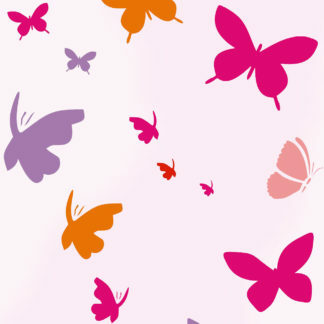 Use a range of bright and pastel colours for this effect. Motif Stencil Paint colours used here – Harvest Gold, Seville Orange, Very Berry, Cerise, Indian Purple, Agapanthus, Kingfisher and Verbena. 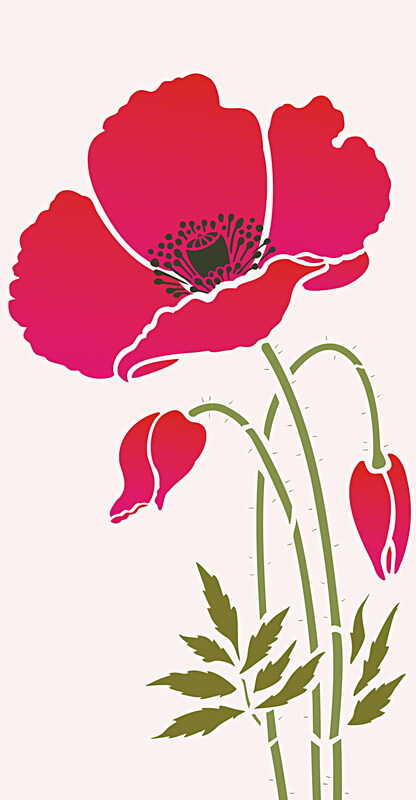 Above – Create an impressive bright and funky oversize wall feature repeating the Giant Poppy Flower Stencil 2 in three bright vibrant tones – alternating flower and stamen colours across the three repeated flowers. Stencilled here in Kingfisher and Chinoiserie (left front flower), Cerise and Ice White (middle flower) and Seville Orange (top right flower). 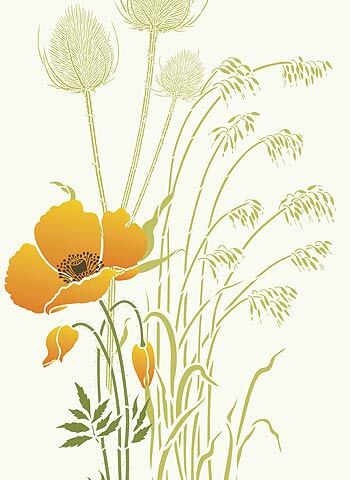 Above – Create this beautiful meadow styled mural using the Giant Poppy Flower Stencil 2 with our Large Teasel Stencil and Oversize Wild Oat Grass Stencil. Stencilled in natural colours of Harvest Gold, Evening Primrose Stencil Paint (poppy flower and buds), Olive Grove, Hedgerow (poppy leaves and stems) and Spring Vine and Grassland Stencil Paint (grasses and teasels). 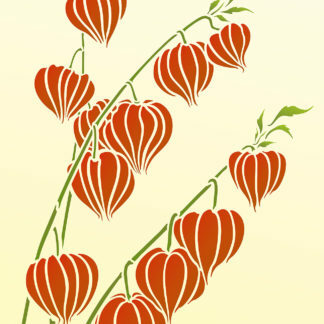 Above – the three striking Giant Poppy Flower motifs, ‘grown’ to different heights using their stalk extensions. Use Giant Poppy Flower Stencil 2 (top left), Giant Poppy Flower Stencil 1 (middle right) and Giant Poppy Flower Stencil 3 (bottom left) stencilled in Very Berry (flowers and buds), Verbena and Olive Grove (leaves and stalks) and Coffee Bean Stencil Paint (stamens and seed pods). 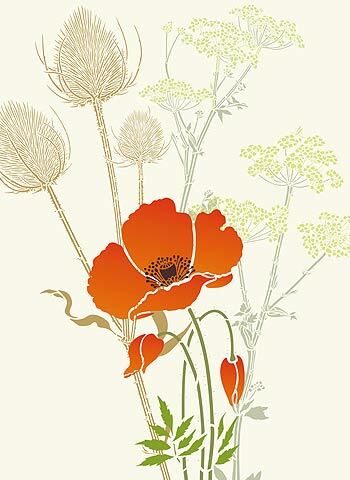 Above – Go for this spectacular meadow mural mixing all three Giant Poppy Stencils together with our oversize wild flowers and grasses. To create this oversize mural use Giant Poppy Stencil 2 (top poppy) with Giant Poppy Stencil 1 (middle poppy) and Stencil 3 (bottom left poppy) and Giant Hogweed Stencil and Large Teasel Stencil. Stencilled here in Very Berry (poppy flowers, buds), Olive Grove, Verbena (poppy leaves and stalks), Umber Charcoal Stencil Paint (stamens and seed pods), with hogweed and grasses in Butterscotch (hogweed flowers), Spearmint (hogweed stalks) and Latte and Grassland Stencil Paints (teasels). 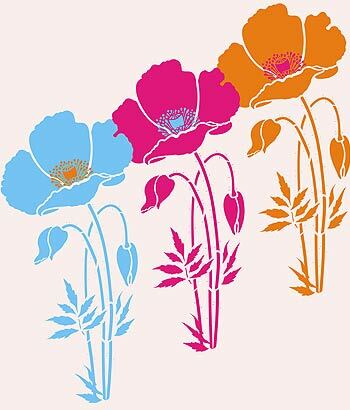 See our Giant Poppy Flowers Stencils 1, 2 & 3 at a reduced combined price. 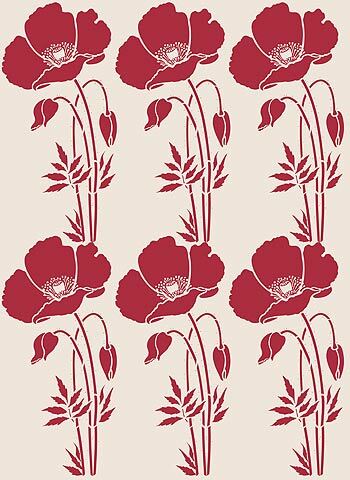 Above – Giant Poppy Flower Stencil 2 repeated in rows to create an impressive oversize pattern repeat for walls and fabric. Stencilled here in Raspberry Stencil Paint with stamens in Orchid Stencil Paint on a pale pink background. An equally impressive finish can be created using gloss varnish on a matt dark painted surfaces for subtle, sophisticated effects. 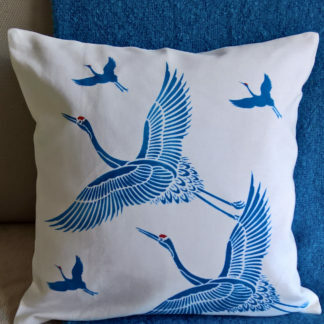 Below – the same repeat effect in Ice White Stencil Paint silhouette style on red and cornflower blue backgrounds – this is a brilliant way to create up to the minute modern country style. 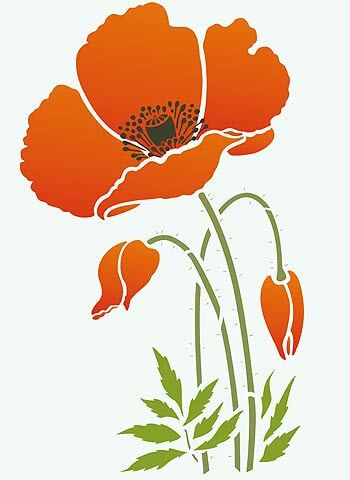 Easy to use one layer stencil on a single sheet – Giant Poppy Flower Stencil 2 comprises one supersize poppy motif with additional stamen details for applying on top of the poppy and two additional stalk motifs for adding to the bottom of the main stalks to extend the height of the flower as many times as required. Also additional leaf motif. Main poppy motif with stalks, buds, seed pods is approximately 86cm (33 3/4″) tall x 51cm (20″) wide. Supersize poppy flower diagonal diameter up to 51cm (20″) wide. Stamen up to 16cm (6 1/4″) wide. Two stalk extensions both 22cm (8 1/2″) tall. Height of poppy with one stalk extension approximately 108cm (3.5 feet). Left – layout of Giant Poppy Flower Stencil 2 – shows the layout of the main poppy motif and stalks and stamen on the sheet.